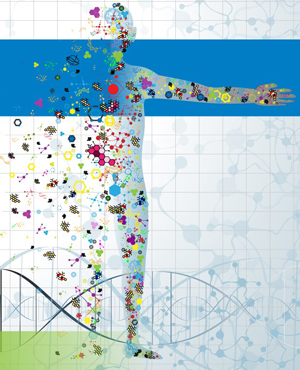 Personalized medicine is the future of healthcare. More and more people are turning to genomic testing for a customized approach in addressing health concerns. We all have genetic differences, making the one size fits all model a thing of the past.Your genes are the blue print to your health.However, gene expression is influenced by your epigenetics, which includes your diet, lifestyle and the environment you live in.Establishing a nutritional supplement plan should be specific to the individual, taking into account the whole person, including their lifestyle, and genetic makeup. Looking at your genetic variants can give us an incredible amount of information about how you process nutrients, detoxify chemicals, utilize iron, balance your gut bacteria, neutralize free radicals, understand your brain’s neurotransmitter function and the list goes on and on. Through genetic testing, our goal is to supply the right nutrients, and targeted supplementation, based on one’s genetic variants that could potentially cause imbalances. To reduce the effects of toxins in the body, support detoxification pathways and to support the healthy rebuilding of cells and organs, is the ultimate goal to building functional cellular health. There are many different reasons why someone may want to look at their genetic makeup. Some major reasons include, ancestry curiosity, to understand potential health conditions by knowing genetic susceptibility, and, a favorite is, for those individuals who are “normal” on all lab tests but still feel tired, irritable, or struggling with digestive issues and cannot determine the reason for these chronic issues. One of the most common complaints from individuals is feeling wired, tired, anxious and depressed. Genetic testing can give some insight into why someone could be experiencing these issues and what they can do about it. Understanding your genome can help provide clues to know what foods and nutrients are most beneficial for you, and which ones to avoid! For those who have a sensitive digestive tract and cannot tolerate supplements, the clues as to what could potentially trigger this can be discovered through a genetic consultation. Genetic interpretation with a MethylGenetic Nutritional AnalysisTM report* can help us learn a lot about why we may not be feeling optimal, as well as, provides a step-by-step approach on how to address each area of concern based on an individual’s genetic makeup. We can use this information to learn how epigenetic factors affect DNA/SNP expression and how to compensate for, and support areas of dysregulation to bring our health back into balance. *MethylGenetic Nutrition AnalysisTM is proprietary software. The information generated by this software is not intended to diagnose, cure, mitigate, treat or prevent any disease. We teach how to use nutrition to support function, which is the permitted use of nutritional therapies. This entry was posted in DNA, genetic, health on September 6, 2017 by Tasreen Alibhai.